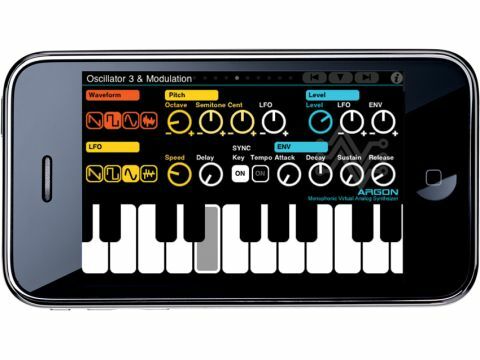 One of the finest-sounding and most playable iPhone synths yet. Awesome sound. Four-bar loop recorder. FIddly if you've got fat fingers. More presets would be nice. It may be just a monophonic synth with a GUI that's prejudiced against fat fingers, but Argon has won our hearts. From wispy, nostalgic leads drowned in noise and delay, to formant wobbles, croaking basslines and the soft pulses of thirds and fifths, Argon can - and frequently does - sound awesome. It's not a broad palette, trapped somewhere between 1972 and 1984, but it's a sound full of character, complexity and fun. The GUI presents two horizontally scrolling layers. The topmost provides access to ten pages of parameters and each parameter is drawn in a radial, anti-aliased style that Ableton Live users will immediately recognise. The lower layer is a scrollable keyboard that lets you switch octaves by dragging the lower border. Argon's incredible sound comes courtesy of a trio of oscillators and a Minimoog-like signal path. You can choose between saw, square, sine and noise for two oscillators, while a third adds formant generation. There's FM and AM, and six different filter types, with 24, 18, 12 and 6dB/oct low-pass modes. An ADSR and LFO give amplitude and filter modulation, and you get distortion, EQ and delay effects. There's even a visual step sequencer and a four-bar loop recorder that features overdubbing, so you can stack up parts to create a tune. You can save the output to an internal preset or beam a WAV across a WiFi connection. We'd like to see named presets and fake velocity (ie, based on where you touch the keys), but all this is besides the point. Argon is the closet thing we've found to carrying a vintage monosynth with us on the bus, only it's far less obtrusive and costs less than the ticket home.